Bifanas are a matter of national pride. There are local variations of bifanas all over Portugal, but any Lisbonian will tell you theirs is the best. Thinly sliced pork is grilled and simmered in a rich, paprika-flavoured stock and served in a soft roll with sweet mustard and chilli. You'll need to marinate the pork overnight. 1. Mix together the garlic, salt, 1 tsp paprika, 1 tbsp piri-piri sauce, vinegar, 1 cup of wine and the bay leaf in a large press-seal bag or lidded plastic container. Add the pork, mix well and marinate overnight. 2. Heat two teaspoons of the oil in a heavy frypan over medium heat. Remove the pork from the marinade, drain and fry in batches for a minute or so each side until lightly browned, then set aside. Add a little oil to the pan when cooking each batch. When all the pork is cooked, deglaze the pan with the remaining cup of wine and add the remaining one teaspoon of paprika and one tablespoon of piri-piri sauce. 3. Bring to a boil and reduce to a coating consistency, then return all the pork to the pan for a further minute, stirring well to coat in the sauce. 4. In a separate frypan, fry the onions in the remaining two tablespoons of oil until softened and caramelised. 5. 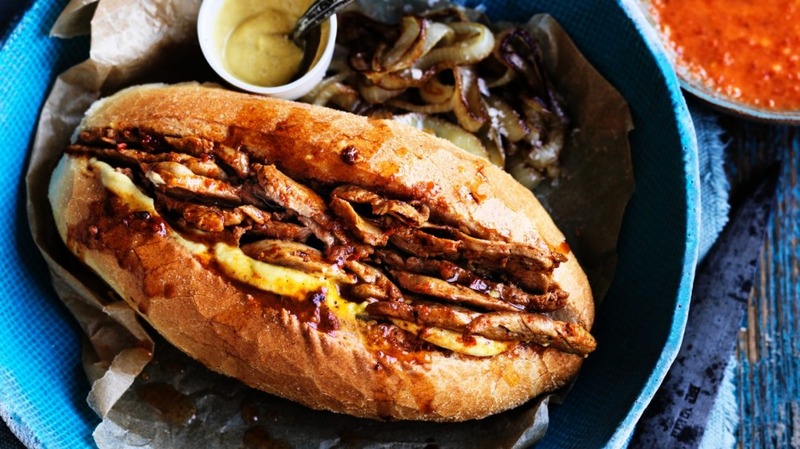 Serve the pork with the onions in soft white rolls with sweet mustard and extra piri-piri sauce.